Yesterday, my boys and I spent nearly four hours playing and learning with Magna-Tiles. 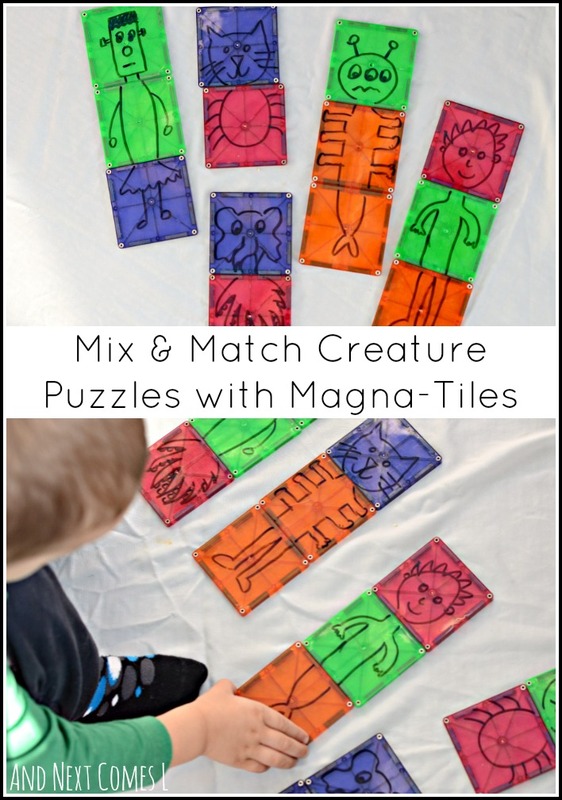 One of the things that we did was create some mix and match creature puzzles. It's purely a silly and fun way to make my kids smile and laugh. They're reminiscent of those mix and match flap books where you can create ridiculously looking monsters or creatures, but I do remember my dad drawing and creating some homemade books for me and my brothers when we were little. And hopefully someone will know what I'm talking about because, frankly, I cannot remember what those books were called. I simply drew some random heads, bodies, and legs on the small square Magna-Tiles. Then you can create crazy cat-spider-alien combinations like below. J didn't really have much interest in this activity, but I'm not surprised. He's not really into silly, abstract things. Heck, he gets upset whenever someone creates a sad monster with this mix and match felt set. They always have to be happy monsters. So like I said, I wasn't surprised when he showed zero interest in playing with my cute little puzzles. K, on the other hand, played with it for a little bit (like 5-10 minutes), giggled a few times, and then moved on. So while I thought they were cool, my boys weren't really that interested. At least not on this particular day. I will be trying these puzzles again in the future, but to vary the presentation, I may put them on our freezer or fridge so that they can play on a vertical surface. They would also be a fun light table activity! Magnatiles are on the top of my Xmas list for zip. Best deal?? Best price that I could find for us here in Canada is Amazon.ca ($124 with free shipping). brilliant and perfect! i am soooo gonna try these for our week of The Mixed-Up Chameleon. Thank you for sharing! Oh now that's a fantastic idea!